“Two people can’t make that much noise.” So goes the cliché. It’s one that has stood the test of time despite an uncompromising legacy of two-person punk bands: Hella, Talk Normal, Japanther, Death From Above 1979, Cibo Matto. And that’s not even mentioning the colors of White Stripes or Black Keys. Why is it then that a band like Washer always takes us by surprise? Rooted in punk, Washer is a pop band. The hooks sink deep, and will draw comparisons to the harmonies of Weezer, but if we’re playing the two-person name-dropping game, Local H is the appropriate juxtaposition. The Brooklyn-based duo of Mike Quigley (guitar/bass/vocals) and Kieran McShane (drums) have been playing, touring, and recording since 2013, releasing an EP and two split 7-inches on ECB&B, the collaborative label they run alongside contemporaries (and friends) Big Ups and Flagland. The latter is important to note, because it’s Flagland’s Nick Dooley that recorded Washer’s debut LP. Here Comes Washer plays like a best-of of sorts, never compromising to one sound. 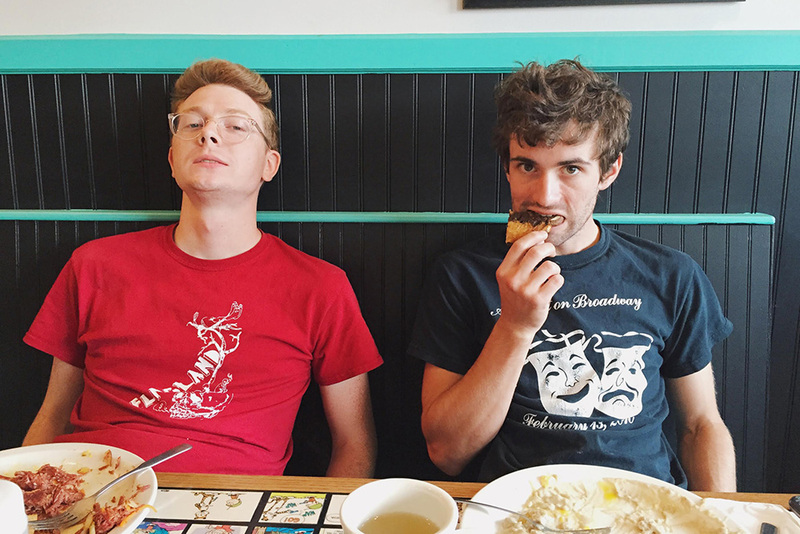 Unlike past releases where noise was a key element, Washer has utilized their two-man persona to deliver a more nuanced brand of their pop-punk. Often stripped of distortion, an air of millenial shoegazing strings throughout the LP, creating an unnerving tension that rides shotgun to the aggression. All while keeping that foot firmly planted in pop. Washer’s not here to cheer you up, they just want you to sing along to their tongue-in-cheek confessionals. Here Comes Washer will be released on January 22 via Exploding In Sound, with an album release show that same night at Palisades. You can stream it in full below.